Taking a break from humanity's woes, let's celebrate the news this week that the Blue whale population has apparently stepped back from the brink of 40 years ago, and is now in healthy territory in one of the three major groups - in this case, those living between the North Pacific and the California Coast. 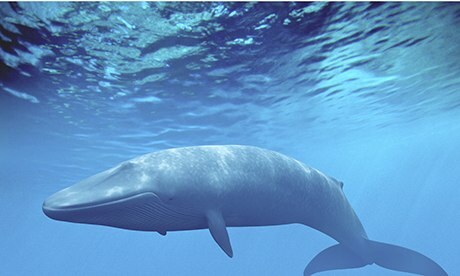 From 1905 to 1971, the Blue whale population plummeted from whale harvesting. When the Blue whale was given protected status in the early 70's, its population was still at risk from increasing ocean traffic. The largest Blue concentration is that found in the Northern Pacific, with a population over 2000. An equally sized concentration, though much less understood or counted is found in around Antarctica and between India and Australia. A third, but much smaller concentration of 500 (clearly plus or minus) is found in the North Atlantic - between Greenland and Iceland. Amazing how small that whale looks next to the cargo ship. I agree with ben, it's crazy how small the whale looks next to the ship!